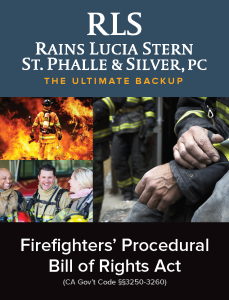 Firefighters Procedural Bill of Rights Act. paramedic or emergency medical technician, irrespective of rank. her employer as a condition of employment. transfer for purposes of punishment. special district, or political subdivision thereof. work missed while being interrogated. nature of the investigation prior to any interrogation. without his or her express written consent. disciplinary action brought under Section 19572.
out of a disciplinary action. (g) The complete interrogation of a firefighter may be recorded. record any and all aspects of the interrogation. under investigation for noncriminal matters. unplanned contact with, a supervisor or any other firefighter. normally be given that duty assignment under similar circumstances. firefighter with an opportunity for administrative appeal. the job of fire chief. omission, or other misconduct occurred on or after January 1, 2008.
specified in the written waiver. prosecution is pending shall toll the one-year time period. time period shall be tolled while that civil action is pending. compensation fraud on the part of the firefighter. not be governed or limited by this chapter. affect the outcome of the investigation. with Section 11500) of Part 1 of Division 3 of Title 2.
the adverse comment indicating he or she is aware of the comment. document, and signed or initialed by the firefighter. personnel file of the firefighter. detector test against his or her will. against a firefighter refusing to submit to a lie detector test. not take, a lie detector test. by the employing department or licensing or certifying agency. the rights and protections guaranteed by this chapter. fees, incurred by a fire department as the court deems appropriate. 128.6 or 128.7 of the Code of Civil Procedure. department is liable under this section. the performance of his or her official duties.